Spending during this season in 2014 on shopping and dining was around 610 billion yuan – about US$100 billion. This is almost double the amount American shoppers spent over the Thanksgiving weekend. The festival is celebrated by everyone and, in a country of extreme wealth that is also home to 7% of the world’s poor, the way that it is celebrated varies greatly. There are a few things that all Chinese citizens have in common though. Most buy gifts for their parents and elderly family members, and 65% of respondents in a survey last year showed that clothes were a favoured item. 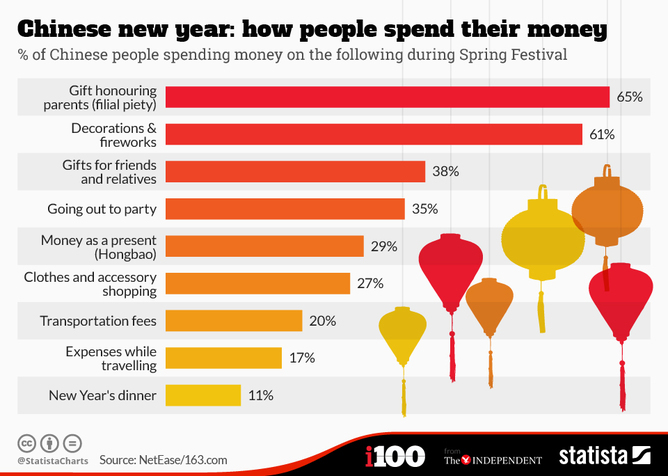 Other significant areas of spending are decorations and fireworks, party goods, transportation costs and New Year’s dinner. Another Spring Festival custom is to give friends and relatives money in red envelopes known as hongbao for good luck. China’s internet companies began to capitalise on this two years ago, with the popular messaging app WeChat launching a way to share money through messaging. Last year saw 500m yuan (US$80m) transferred using the app, which we can only expect to increase this year as other apps offer the service too. In 2015 Chinese consumers spent more than US$100 billion on luxury goods, accounting for 46% of the world’s total. Around 80% of these sales are made abroad. Attracted by the weaker euro and Japanese yen, Chinese consumers are increasingly opting for Europe and Japan, instead of their traditional shopping hotspots of Hong Kong and Macau.